Ah – it’s that time of the year again. Breeze is getting cooler, days are getting shorter, and brides are slipping into gorgeous wedding dresses. Yes girls, its wedding season. I don’t know about you but I do find the idea of shelling thousands of dollars on a single dress that you will wear for exactly one day to be crazy. I know cameras would be following you and you would like to look your best. But you surely don’t want to rack up the biggest debt imaginable to create the most opulent look imaginable! I may have gone too far here but weddings indeed have become an extremely expensive affair. So what if you are planning a trip down the aisle and have a really tight budget? Does this mean you have to compromise on your dream dress? Fortunately, no – there are ways you can cut the cost without having to cut the style of your wedding dress. Rather than going for the expensive silk or satin, pick fabrics like chiffon or less intricate lace to look equally amazing in these affordable elegant dresses. Subtle details like a lace bodice, crystal studded neck or waistline will not only cost less but will also look more sophisticated and feminine than an entire lace dress or gown with embellishments all over. There is simple logic here; the more the fabric of a dress, the higher will be its cost. If you are blessed with a good figure, why not choose a slim-fitting dress and stun the gathering with your flattering looks? Agree, nothing can replace the romantic feeling of visiting a bridal salon to try on different dresses with your mom and BFF. But online wedding stores with their plethora of options in unique colorful designs do greatly increase your chances for finding that perfect gown within your budget. There are so many good bridal stores that carry stunning sample dresses in one size. If you like a sample dress that needs only minor alterations, you can easily ask the bridal store owner to sell that dress to you on a discounted price. Most store owners would be happy to sell their ready-made dresses at super-discounted rates. 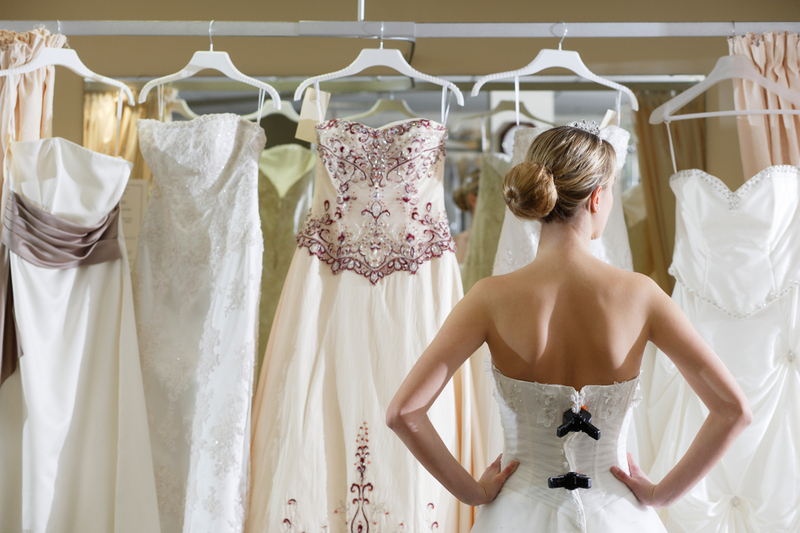 If your wedding is already over budget, consider renting your bridal gown. After all, you are going to wear it for just one day and the good thing about renting is you can easily afford a higher-end designer dress this way. Well, these are my tips for finding that perfect wedding dress on a budget. What are your thoughts on picking the most fashionable and flattering wedding dresses without putting your bank account in red? I think online shopping is somehow good too, more practical for sure! I went to many shops with friends of mine and yes, the prices are wow, so expensive. But all is justified by “it’s such an important moment”. I think whatever the way, online or not, there are ways to find something nice on budget! All points covered perfectly… nice post dear..